Take a moment to imagine working for yourself on a daily basis, with no one telling you what to do. You can take on projects that appeal to you the most and feel proud as you watch them grow and add value to the market. If this is a scenario sounds more interesting to you than spending your days working 9 to 5 for someone else, then you likely have an entrepreneurial spirit. Perhaps you've always dreamed of being your own boss, but have feared to start your own business because you lack the time and money, and maybe you don't feel like any of your ideas are good enough. Perhaps you're afraid of setting out on your own because you're afraid of putting yourself and your family at risk. However, the good news is that it has never been easier to become an entrepreneur as it is today. The Internet has helped to reduce most of the barriers to entrepreneurship. Today, you can start building your business while still working at your regular job and only investing an hour or two a day tending to your business. Plus, today you have access to a goldmine of information to help you succeed in the form of podcasts, books, blogs, etc. You can take advantage of others’ experiences and knowledge and use it to build your project much faster and safer than before. The only thing you need to be successful is a deep commitment to learning and the willingness to put some effort into achieving your goals. The cost to start and operate an online business is minimal, as is the financial risk. All you need to purchase to begin your company are a domain name and hosting service, which you can obtain for around $6 a month. For the rest, it will depend on what type of product or service you're going to sell, but it is entirely possible to start your business with as little as $100. With an online business, you also are able to work from anywhere you want, whether you decide to work out of your home or head to a café or co-working space. You can choose where to live, and you have the freedom to organize your schedule almost entirely as you wish. The best part of it all is that you won’t be stuck in a cubicle all day long, or eat lunch at the office cafeteria, or spend hours stuck in rush hour traffic. And most importantly, your salary won’t be limited to what an employer is willing to pay you. If this doesn’t sound like a professional paradise to you, then maybe you should stay at your 9 – 5 job. However, if this sounds like a job you’d like to have, then an online business is right up your ally. In the 1970s it was difficult to come up with a business idea that corresponded to those criteria, but today it is entirely possible thanks to the Internet. 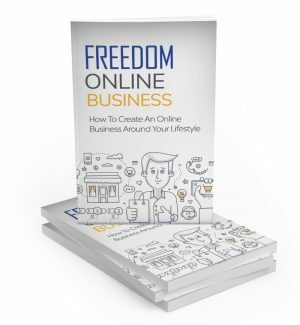 There are unlimited possibilities for you to find your passion and make a successful online business that provides you with passive income and that will fit your lifestyle. While many people want to start a business and become their own boss, they are held back from taking action because they don't know what kind of business to start. Not knowing where to start, most people choose to remain where they are and not take the risk. A topic you're interested in + people you like and want to help + a problem they have + a solution you can provide to the problem, which you'll package into a product or service of your choosing. If you already have a business idea, then all you will have to do before you get started is to validate your idea, which you’ll learn about in Chapter 2. However, if you haven’t found an idea yet, you’ll need to start questioning yourself. First, you need to reflect on your interests and the lifestyle that you are hoping to attain, as well as reflecting on your natural strengths and the skill set you already possess. Determine What You Dislike About Your Current Job and Lifestyle and What You’d Like to Change There must be one thing, or many, that you don't like about your current situation. Maybe you don't like the lack of free time in your life, or perhaps it's the commute to work that has you down or even being told what to do, or possibly the lack of a sufficient income. It is essential to be specific when defining what it is you are trying to escape from so you can avoid recreating it in your new lifestyle. For example, if a significant issue for you is a lack of free time, then you shouldn't opt for a business model that will require an equal amount of your time, like freelancing. Instead, you need to choose a model that will generate passive income. What Do You Like About Your Current Situation? Not everything is wrong with your current situation. Maybe you enjoy the relationships at your work and working in a team. You probably appreciate the fact that you don’t have to think about your work after you’ve clocked out. It’s good for you to know what you like if you want to be able to reproduce this in your online business. For example, even if being a web entrepreneur means working by yourself most of the time, there different ways that you can add social occasions to your new entrepreneurial life. You could share working space with other entrepreneurs and freelancers. You could also attend Meetup groups in your field and meet up with other like-minded individuals occasionally.